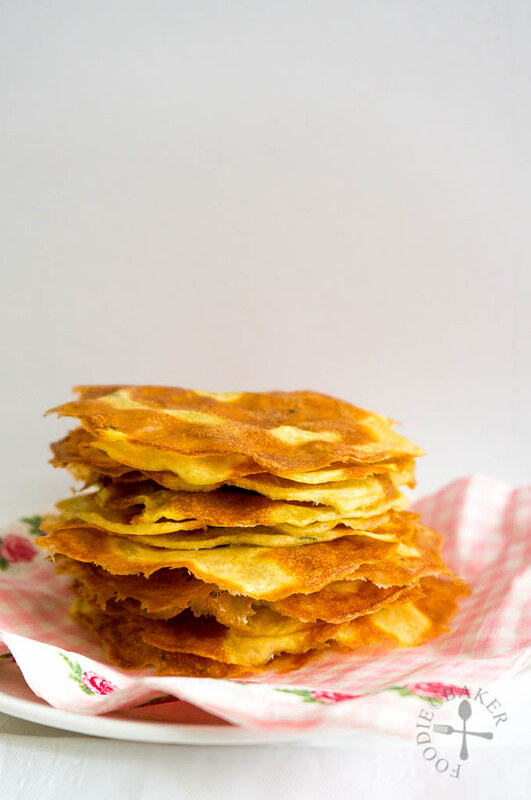 When I was Googling for potato recipes to try, I saw quite a few baked potato chips recipe, somehow that reminded me of tuiles and off I went searching for potato tuile recipes! There are a few that used instant mashed potato – something that I will never buy because I don’t like the taste of it. 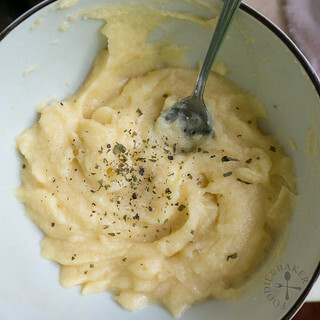 Luckily I managed to find one recipe that uses real mashed potatoes! 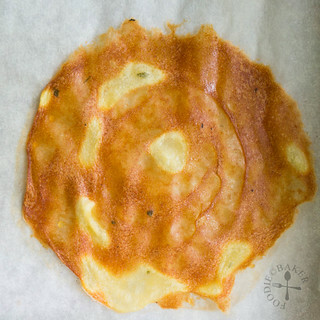 Making these tuiles is very easy, just mash a cooked potato with butter then whisk in the whites. I strained the mixture to get rid of lumps before mixing in salt and ground black pepper. Then they are ready to be baked! Feeling lazy to prepare a template, I simply spread a teaspoon of potato mixture and spread it out thinly with the back of a spoon. Because the tuiles are very thin, they are very crispy when fresh out of the oven! They must be kept in an airtight container immediately once they are cooled so that they retain the crisp. One problem I faced was shaping them into a tuile shape. If I underbake them, the tuiles won’t be as crispy and are also not able to hold their curved shape well. But if I bake them for too long, they will crack when I try to bend them. So in the end I left them flat, similar to the original recipe. I decided to make a prawn salsa to go with the potato tuiles. In order to allow the tuiles to be soft enough to bend and hold the salsa, I under-baked the tuiles a little. 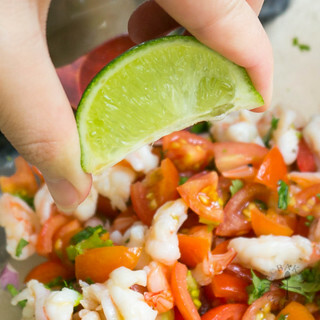 The prawn salsa is also very easy to prepare and would have been even better with some avocado added (I omitted it because avocados are pretty expensive here)! 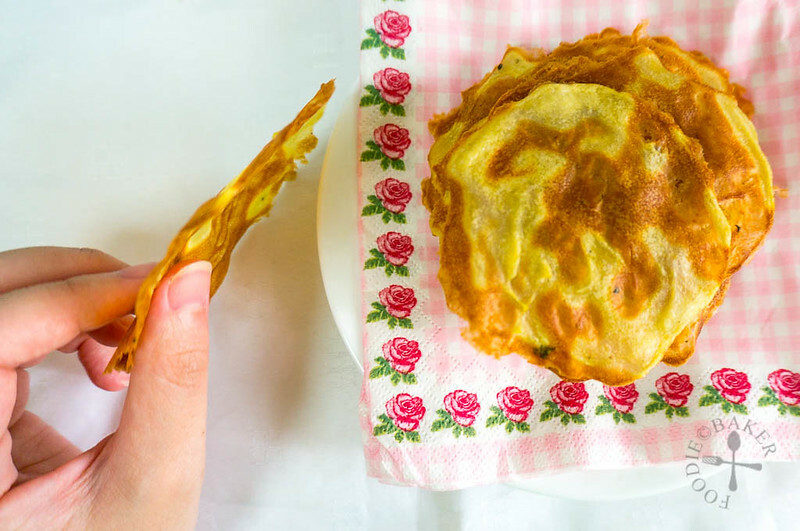 I definitely want to make this again – I’d probably make them thicker and stacked them as an appetiser, just like the one in the original recipe… will plan for it one day! 1) Peel, boil and drain the potato. Set over a colander to let the potatoes steam dry. 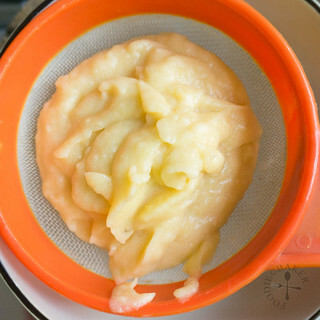 2) Mash the potato and mix in butter while the potato is still warm. 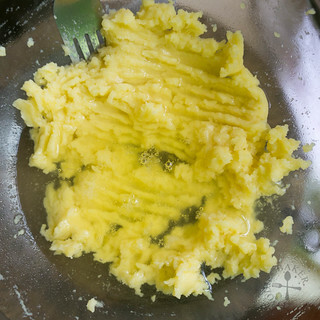 3) When the potato has cooled down, whisk in the egg whites until fully incorporated. 4) Strain the mixture through a sieve to get rid of lumps. 5) Mix in salt and black pepper. Add in herbs if desired! 6) Spread the batter thinly with the back of a spoon. 7) Bake until golden brown. 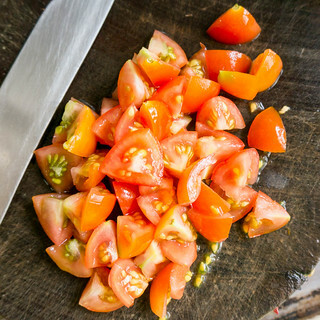 8) Meanwhile, chop some tomatoes. 9) And cook some prawns. 10) Dice a little onion for some crunch. 11) Snip in some coriander. If only I have some avocado... 12) Add in olive oil and lime juice and mix well! 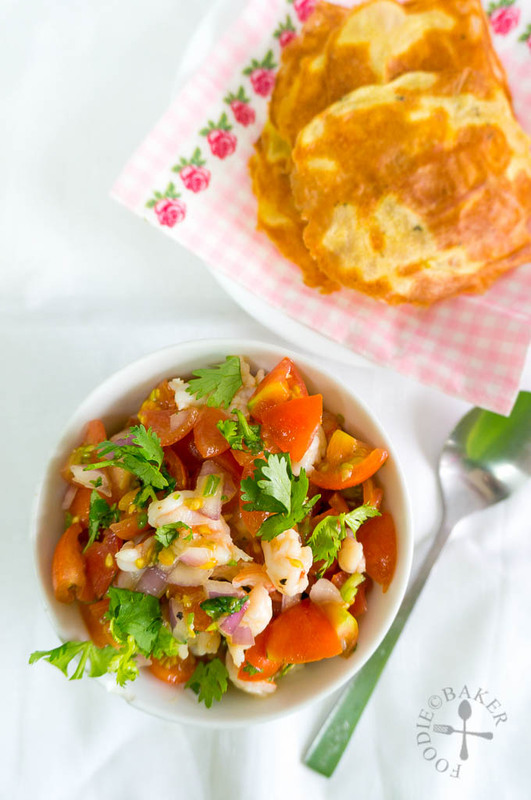 Yummy tuiles and addictive prawn salsa! 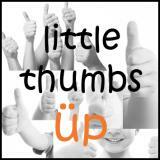 I’m submitting this to Little Thumbs Up (July 2014 Event: Potato) – organised by Zoe (Bake for Happy Kids) and Mui Mui (My Little Favourite DIY) and hosted by me! Do hop over HERE to see the linkup! Peel and dice the potatoes. Place the potato dices into a small pot and cover with water. Add in a little salt, bring to a boil and simmer until the potato has softened. 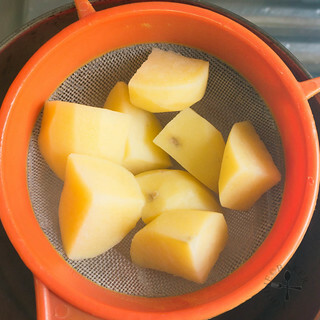 Drain the potato dices into a colander and set the colander on top of the pot to allow the potato dices to steam dry. Once the potato has cooled down slightly, transfer to a mixing bowl. 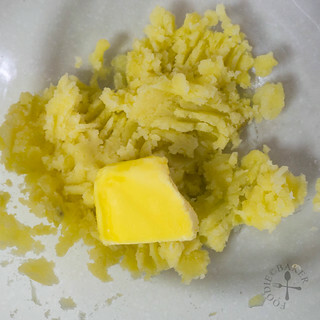 Mash the potato dices and mix in the melted butter (best to go through a potato ricer if you have one). Let cool till warm then whisk in the egg whites until fully incorporated. Strain the mixture into a clean bowl then whisk in the salt, pepper and herbs. Preheat the oven to 175 degrees Celsius. Line a baking sheet with baking parchment. 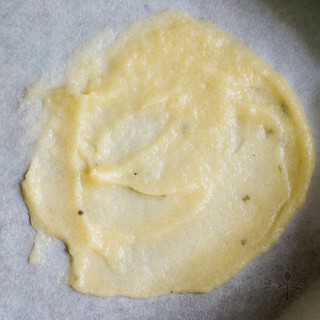 Spread a teaspoon of tuile mixture thinly on the baking parchment with the back of a spoon. You can use a template if you want perfect circles. Use more mixture if you'd like a bigger tuile. Bake for 10 to 12 minutes until the tuile is golden brown in colour. Peel and devein the prawns. Chop them into small pieces and marinate with 1 teaspoon of salt. Set aside for 10 minutes. Rinse the prawns and drain well. 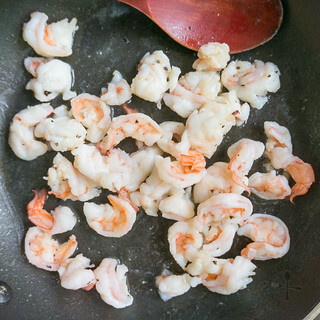 Sauté the prawns in a little oil / butter and season with salt and black pepper to taste. Remove the cooked prawns from heat and let cool. 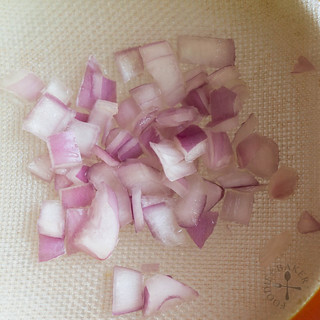 Soak the diced onion in cold water for 15 minutes. Drain well. This will help to get rid of the bite of the onion. 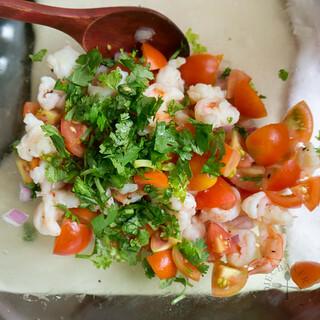 Combine the cooled prawns, chopped onion, chopped cherry tomatoes and cilantro leaves together. Add in a little olive oil and lime juice and toss well. Season with salt and pepper. Taste if it needs more oil or lime juice and adjust to your liking. Cover and set in the refrigerator for at least 30 minutes. for the flavours to mingle. That is so addictive! Your crispy tuiles are very tempting! Mmmmm this is the first time I heard of this dish, definitely another must try, good replacement for crackers. 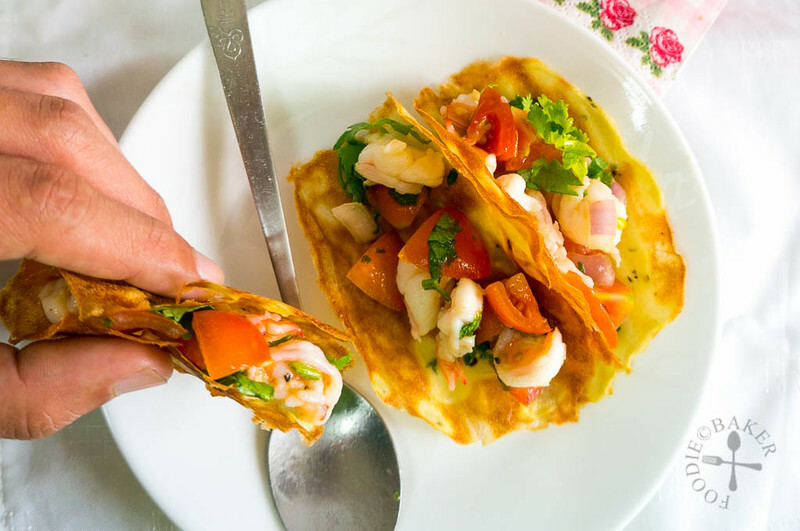 The crispy potato tuiles looks tempting … think before serving with the prawn salsa, my kids would have just munch all of them. Thanks for sharing^-^! Your tuiles looks so yummy…I guess the underbake version must be very yummy too!